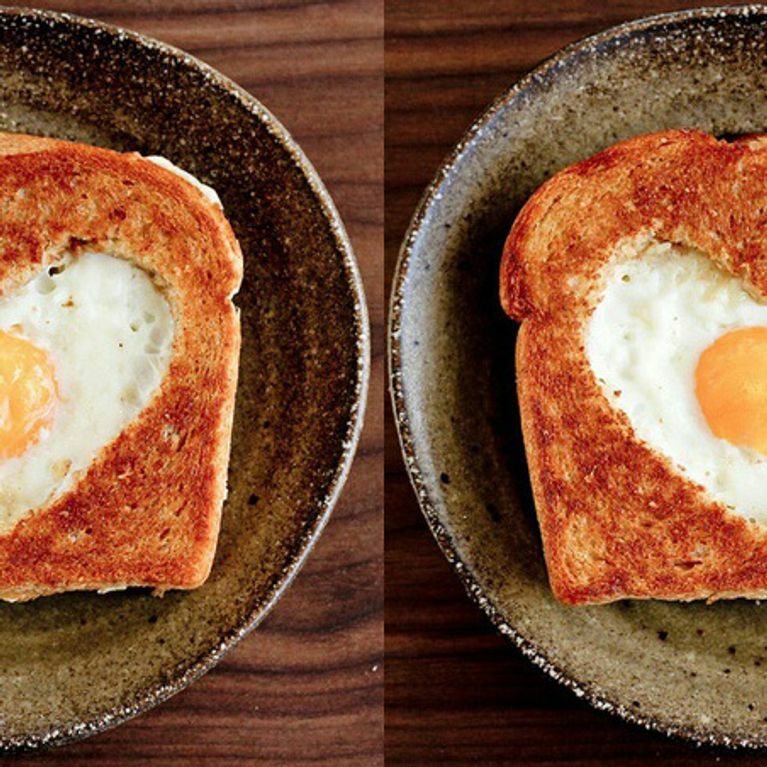 This week is National Egg Week and damn does that make us excited. They're a cupboard staple with a world of possibilities and you can pretty much eat them for every meal if you really wanted to. But the difference between a bad egg and a cracking egg can ruin the most perfect of breakfasts. Here's how to avoid any egg-related travesties. The first rule of Egg Club is that you don't talk about Egg Club. The second rule of Egg Club is that you DO NOT. TALK. ABOUT EGG CLUB. But the third rule is simple: make sure your eggs are fresh before you cook them, because you ideally want them to stay down once you've eaten them. The way to tell if you've got a fresh egg is that the white should be firm and stay bound to the yolk. If you're not sure, there's a simple way to test the freshness: place your eggs - still in the shell - in a bowlful of water. If they float, they're no good. If they stay at the bottom, cook those fellas up. Rookie mistake, my friend. If you crack your eggs on the edge of a bowl or give it a gentle whack with a knife, it's likely you're going to break the yolk, and a broken yolk is kinda hard to make beautiful poached/fried eggs with. Instead, crack your egg on a flat surface, and here's the intricate science behind it: a flat surface means that the pressure when breaking your eggs is spread evenly, so you'll get one clean cut. Plus, all your friends will be super impressed with your egg-based tricks. Yes, there is such a thing as under-whisking, and you don't want to be the fool that does it. So really whisk your eggs until you're sure all the yolk is combined with the white. Otherwise you'll get weird white flecks in your scramblies and it'll taste kinda weird and inconsistent. So take a tip from Michael Jackson and beat it - just beat it. I know, I know. It's a super fine line if you wanna get your eggs just right. But if you whisk it TOO hard and you're making an omelette, for example, you're going to have too much air in your eggs and that'll make all these air bubbles appear, and you want the omelette to be made of eggs, not air, right? So make sure you really whisk your eggs together BUT stop when it's completely mixed. There are plenty of places you want to be hot hot hot. The bedroom, karaoke, a work exam. But if your egg pan is too hot it's going to ruin your eggs and god damnit I will NOT let that happen to you. Nobody deserves burnt eggs, NOBODY. I mean yeah, your pan need to be hot, but it doesn't need to be scolding. It's better to start on a lower temperature and bring it up than burn your eggs straight away on a boiling hot frying pan. Plus, hot egg splatter will give you major ouchies to your arms and face, not to mention ruin your favourite jumper. So, to sum up, temperature is tres tes important when it comes to cooking so, like my old friend Flo Rida once said, keep the temp low low low low low low low low. Or something. Yeah, eggs are a real tricky business, and people like to enjoy their eggs differently, but I'm pretty sure no one likes eggs that have the look and consistency of a yellow brick plucked straight from under Dorothy's sparkly red shoes. A good egg should be firm, but a soft firm, and slightly runny in the centre for omelettes and scrambled. When it comes to a boiled egg it's every man for himself, but generally 7 minutes in the water will give you fully cooked yolk, whilst 5 minutes will give you a runny fella. If you like it somewhere in between, cook it somewhere in between (i.e. 6 minutes). WHY? WHY WOULD YOU DO THIS? Do you not like having nice things? Look, eggs and stainless steel do not mix. I repeat: eggs and stainless steel do not mix. They stick to the pan, and it'll scramble them right up even if you didn't plan it that way in the first place. So get yourself a lovely little non-stick frying pan to fry your eggles to ensure they stay that way from beginning to end. And if I see you with a stainless steel pan again you are OUT of Egg Club. If you find shell in your eggs don't just leave it there and hope that your boyfriend gets that bit. It can seem hard to do but there's a simple way to fish that pesky shell out: just use another piece of shell to haul the lost piece out, and that's it. It's as simple as that. So don't be faffing around with a spoon anymore, ok? No no no. This is not the way to do it. Your boiled eggs are like football players: once they're done, they need to soak in an ice bath. But only for a short time - once they're cool enough to touch you need to get the shell off, otherwise you'll be in for a mildly annoying time. There are soooo many ways to cook eggs that to fry them every time is almost like doing them a disservice. Instead, try thinking about baking them, covering them in spices, or my personal favourite, adding them to a cake mix and eating a Victoria sponge to yourself on a Saturday night. The possibilities are endless.